Completely by accident, I was driving on 9th Street in Charlotte, NC and for 2 seconds I spotted what looked like a restaurant on the corner of 9th and N. Pine Street. At that moment, I couldn’t stop but was immediately struck by the homey quaintness that briefly caught my eye. I didn’t know the name of the restaurant but I knew I saw an amazing sparkle and in my intrigue I returned in an informational drive-by and discovered a rare gem-the one rare gem that sporadically pops up in cities like Charlotte, NC. This is where I foundAlexander Michael’s Restaurant and Tavern. I must preface with the information that 9th St and its neighborhood is one of my favorite neighborhoods in Charlotte. The land once owned by the Charlotte Berryhills, a locally, well-known family and the beautiful Victorian houses remind you of Bourbon St. in New Orleans, illustrated with modern townhomes and boutique businesses. The atmosphere is inviting for a lovely afternoon walk and the view of Downtown Charlotte is striking. 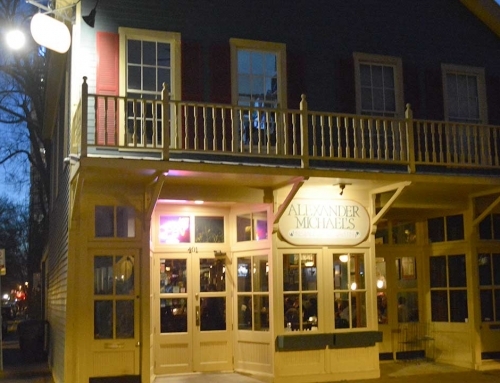 So, to come upon a restaurant whose attainment sits perfectly among the 9th Street history -Alexander Michael’s will be celebrating their 30th Anniversary next year-was like finding a brand new, once in a lifetime vintage Christian Louboutin shoes (or if one is a man, vintage Jordan’s). As soon as I entered the restaurant for the first time, I was impressed with the friendly atmosphere and happy staff. I became more complacent once I saw the 99.0% inspection grade and when the bar tender immediately greeted me. Cooper was his name. Cooper Casner, the owner’s very handsome son, was delightfully serving exquisitely made mixed drinks while carrying on a conversation with one of his patrons. My friend and I arrived at 8 p.m. and Cooper ushered us to a quietly darkened booth so I can gather information and indulge. The atmosphere was mad chill, with a calming ambiance and acid jazz, jazz, and light electronica playing. Our server was Courtney who has been a loyal employee of Alexander Michaels for two and a half years. And according to Courtney, she was the “youngest employee”-meaning all other employees have been there for 10 years or more and completely happy. Loyalty is why Alexander Michael’s is a rare gem. Not just because of its beautiful, Southern-Bayou style venue that also has an office and an apartment that is occasionally rented to its employees upstairs. Nor was it the amazing food or perfectly made Cosmopolitan the main reason. No, this gem sparkles with the one rarity that is so hard to find in businesses: loyalty. As my friend and I sat and enjoyed our extremely fresh Caribbean Jerk Chicken Quesadillas, which, by-the-way, melted in our mouths like butter, we mutually observed a Marriott Residence Inn van drop off four smiling customers, whom Cooper greeted one by name. We also noticed several people who walked from the surrounding homes come grab some good take out. And when asked, Cooper expounded. Loyalty. And as my friend and I stuffed our faces with decadents we observed more and more customers flow in the restaurant and Cooper less and less becoming available to talk due to his happily engagement with his customers; getting drinks and holding conversations, and every once in a while ensuring I had answers to my questions. “It’s best to be here before 7:30 or 8 p.m. to avoid a wait.” Cooper said as he briskly stood up for the fourth time to greet a customer. The tavern opens at 11 a.m. and serves lunch until 4 p.m. and then dinner until close. Cooper closes shop at 10 p.m. Monday thru Thursday and 11 p.m. Friday and Saturday. “We don’t care if a customer comes in at a minute until closing, we will cook their order.” Oh, yes, there’s that loyalty. The tavern is closed on Sunday’s however open to private parties ideally for 40-60 people. Al Mike’s was named after the first owners A. Michael Troiano and Alexander Copeland, III, who brought the old general store and renovated the historic location with wood from the old Independence Building (once sat on the corner of Trade & Tryon St.) and opened doors April 27, 1983. Steve Casner purchased the restaurant in 2005 and firmly stands with the original values of (extremely) good, amazingly prepared food, an impressive selection of beer and prices that are irresistibly reasonable. The tavern is not much of a sport’s bar because this restaurant is insisting on a calm and inviting atmosphere minus the inevitable hustle of such establishments but if one wants to watch a game, by all means. 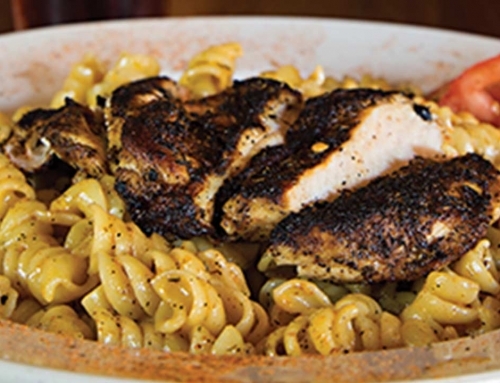 Composed by Steve, the menu ranges from Caribbean or Louisiana style to Southern Soul (jerk and blackened dishes to beef stroganoff) and the most one will spend on a dinner entrée is $15.75 for Shrimp Marsala. The London broil is $13.50! I am a steak girl, all day! All ingredients are fresh and Al Mike’s purchases locally. As I was wrapping up my notes and once again, the exquisite Caribbean Jerk Chicken Quesadillas, Cooper told me the story of the most loyal customer of Alexander Michael’s, Ken Acres. Mr. Acres didn’t necessarily know how to cook and came to his favorite restaurant for a quiet lunch or dinner (or both) for 25 years. He would come in and talk with Steve and observe young Cooper’s growth, happily spilling about his day, his family and his hobbies and a lasting friendship developed between Steve and Ken. One day, Ken was called by whatever Spiritual being one may believe in and in his will stated he wanted his ashes scattered in a specific area some 750 miles away from Charlotte, NC. Steve Casner was obliged to drive the mileage for his friend, at no cost, just love and he scattered the ashes in honor of the most loyal customer Alexander Michael’s would ever know and a friend he would dearly miss. Loyalty. That intriguing urge to stay with what one truly adores and no matter how much something may try an attempt to change that person’s adoration, loyalty keeps that person still. Alexander Michael’s has truly given many reasons as to why customers and employees are so loyal. If you live in Charlotte, or planning a visit, schedule a lunch or dinner at Al Mike’s, trust me, you will not be disappointed. You will be instantly hooked and will plan your next visit by the end of your meal. You will be smiling the entire time, comfortable, like sitting in a huge family kitchen but with your own private stowage to have a quiet conversation or just enjoy yourself peacefully. And keep your eyes and minds open. You may wind up having a conversation with a Federal Judge.